Greeting from CarbonCare InnoLab (CCIL). Christmas is around the corner! You may be struggling with choosing an appropriate Christmas gift for yourself or friends. This year, we are pleased to announce that CCIL crossovers with WeFill, an “Innoteam”, which is nurtured through Jockey Club CarbonCare Open Innovation Lab (JC COIL). WeFill offers and delivers plastic package-free and natural daily essentials such as bamboo toothbrushes and laundry pods and unique refill service as a sustainable alternative to packaged products. 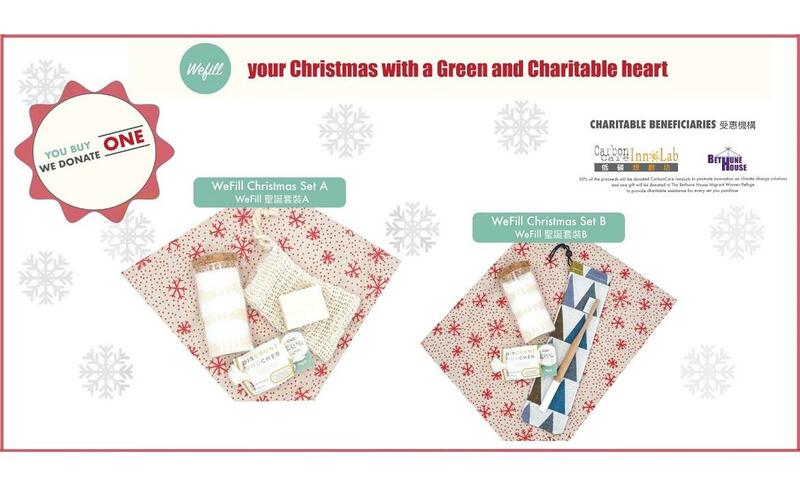 The “WeFill x CCIL Christmas Buy-One-Give-One” campaign that WeFill is offering is a more environmentally friendly, socially conscious and philanthropic choice of Christmas gift. For each set that you purchase, another set will be donated to Bethune House Migrant Women's Refuge. 10% of the proceeds will also be donated to CCIL to promote the innovative climate change solutions. The holiday is full of fun and joy but at the same time a huge amount of waste is produced and end up at the landfill every year. To avoid giving presents with excessive wrapping or unsustainable items, you may consider buying our Christmas gift package. Let’s make a greater social impact by reducing waste! For more information of Bethune House Migrant Women's Refuge, please Click here. For more information on CCIL, please Click here. Click here to purchase. Indulge yourself for Christmas. Fill the heart of migrant workers with warmth. Make Hong Kong a sustainable home. Thank you in advance for your support! Wish you a Merry and Green Christmas!